This manual contains a procedure for description and analysis of geological exposure including: selection of a study site, preparation of the geological exposure under study, descriptions of the profile for the selected geological structures and interpretation and presentation of the results. When conducting complex field studies with students, introduction to the geological structure of the studied area is an integral and important part of ecological research as well as environmental education. Properly organized geological studies will enable young researchers to understand the origin and evolution (developmental process) of ecosystems within the area, and to assess developmental perspectives of its vegetation, water regime and fauna. As a result of field geological studies it is possible to characterize structure, age, conditions of formation and embedding of rocks; features of the relief, connections of forms and elements of the relief with geological structure; geological processes that take place now and that took place in the recent past. The educational task is the study of properties of sedimentation, with stress on the study of alluvial sediments. Studying sedimentary rocks and alluvial deposits, one can approximately judge geological structure of the given area, about conditions of its formation as a whole, and of each geological horizon separately. The goal of this educational task is to introduce students to the geological structure of their region. One of the most important, meaningful (intellectual) parts of this study is not just detection and description of different geological horizons but also structure of the landscape relief. The procedure for studying the geological structure of plain river valleys flowing in loose sedimentary deposits is considered in this manual. Only in such conditions does the river have the possibility of free development, forming well-expressed valleys with sedimentary deposits many meters thick, which can be easily studied. The study of the geological structure of mountain river valleys is not provided by the given educational task, as their development is limited with flow-resistant rocks, furthermore, they are described differently. Processes that take place in the flow of water determine how the relief forms of a river valley (floodplains and terraces located above flood lands) were shaped. These processes cause the river either to branch, forming islands, or to meander, i.e. to curve, forming ridges of river deposits within the channel (which are usually located from one peak of the meander to another). In the low-water period, peaks of these ridges can tower above the water level and can be overgrown with grass. A floodplain is formed by attachment of these ridges or islands to the bank with their subsequent overlapping with inundated alluvium. The geological base of the fluvial plain is laid down by riverbed alluvium, overlapped by inundation, which is modified by the river during a period of regular inundation in flooding (caused by snowmelt) and high water (caused by rains). The floodplain is no longer a floodplain when it is not flooded any more – then it turns into terrace located above flooded land (further in the text TLF). 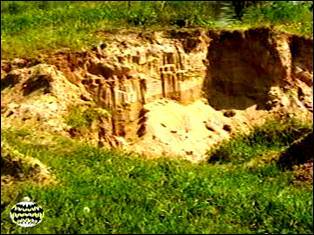 It can occur when a river erodes further below the surface of the land, or there is a decrease in the river flow. Three types of river alluvium are known: riverbed, inundated and old-channel. It is necessary to distinguish them, as different types of alluvium are formed under different conditions and their external shape (appearance) allows us to make conclusions on their origin.